In today's ultra-competitive world, the average supermarket has forty thousand brand items on its shelves. Car shoppers can visit the showrooms of over twenty auto makers. Differentiating products today is more challenging than at any time in history, yet it remains a key to a company's survival. 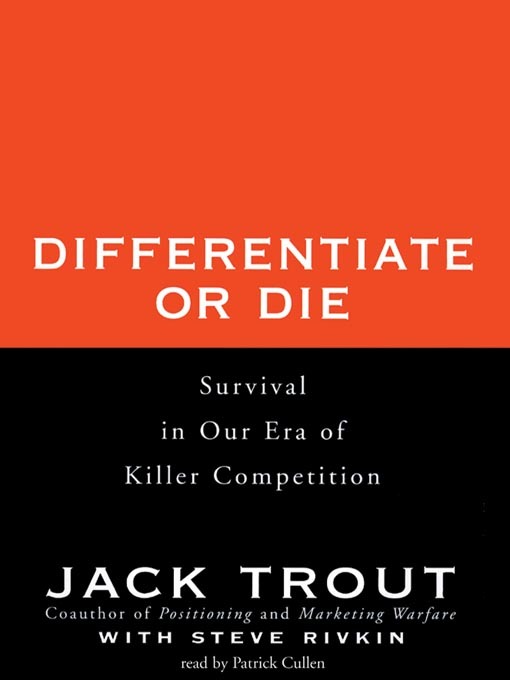 In Differentiate or Die, bestselling author Jack Trout takes marketers to task for taking the easy route of high-tech razzle-dazzle and sleight of hand instead of marketing their product's uniquely valuable qualities. He examines successful differentiation initiatives-from giants like Walmart to tiny Trinity College-to determine why some succeed and some fail. The author outlines the many ways to achieve differentiation, while also warning of how difficult it is to achieve differentiation by being creative, cheap, customer oriented, or quality driven, things that your competitor can do as well.